The factors listed earlier have been organized in a framework of six categories with a number of subfactors as shown in the following Table. According to Staehle's materials degradation model, all engineering materials are reactive and their strength is quantifiable, provided that all the variables involved in a given situation are properly diagnosed and their interactions understood . The corrosion based design analysis (CBDA) approach was further developed from the initial framework as a series of knowledge elicitation steps to guide maintenance and inspection decisions on the basis on first principles . The two most important of these steps are described in the following Figures for respectively the environment and the material definitions. Each of the numbers in brackets in these Figures identifies an explicit action that needs to be considered for each definition. "Inhibition" refers to actions taken to minimize corrosive actions. This usually involves additions of oxygen scavengers or other chemicals that interfere directly with the anodic or cathodic corrosion reactions. 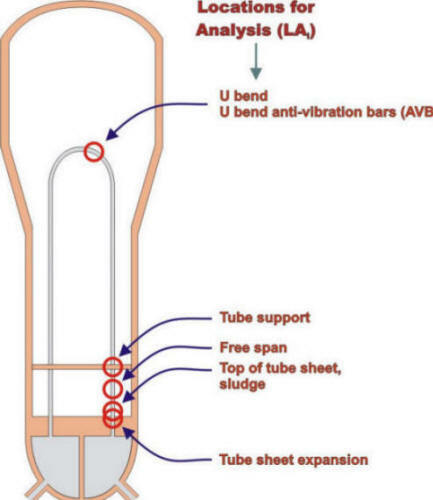 The end point of the process is an input to a location for analysis (LA) matrix that is illustrated inthe following Figure for the locations in a steam generator. 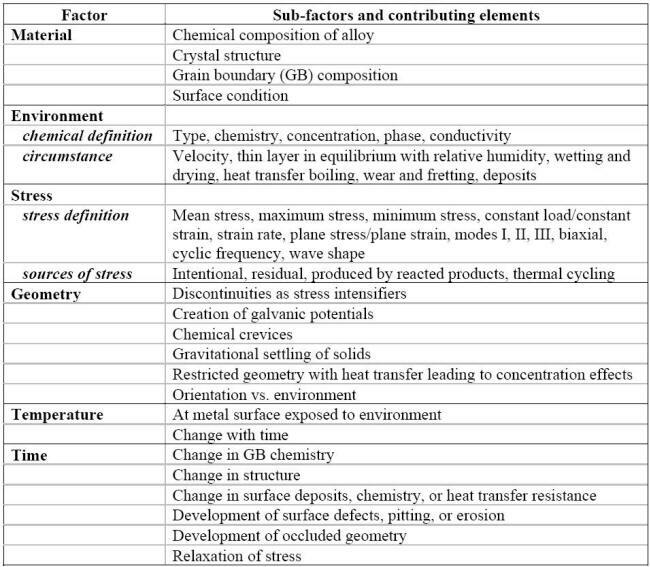 The LA template of the locations that correspond to most likely failure sites along tubes in a steam generator of a pressurized water nuclear power plant is detailed in the following Table for the main failure modes and sub-modes considered in such analysis. Maintenance and inspection actions can be decided upon by following developing trends monitored in each LA matrix thus produced. 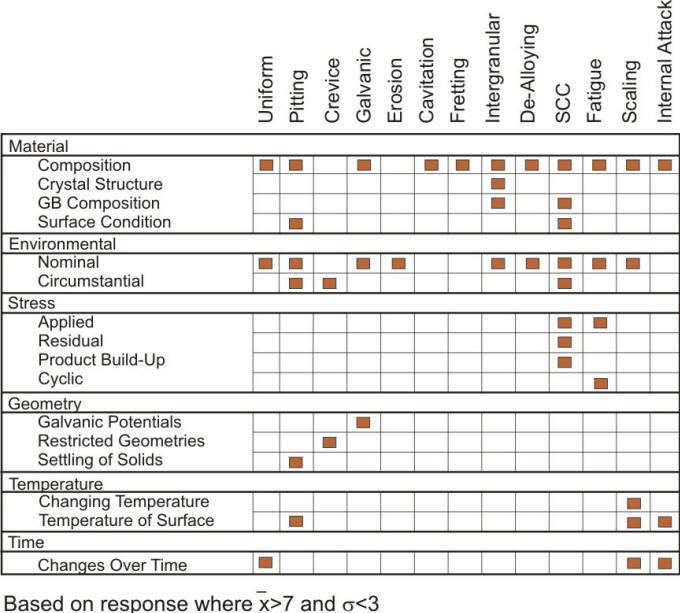 The framework summarized above, which was initially developed to predict the occurrence of stress corrosion cracking (SCC), was extended to other corrosion modes/forms. Additionally, an empirical correlation was established between the factors listed in Table of factors and the forms of corrosion described earlier in the previous Module. Recognized corrosion experts were invited to complete an opinion poll listing the main sub-factors and the common forms of corrosion as illustrated in the example shown in the following Figure. Background information on the factors and forms of corrosion was attached to the survey. A total of sixteen completed surveys were returned subsequently analyzed. 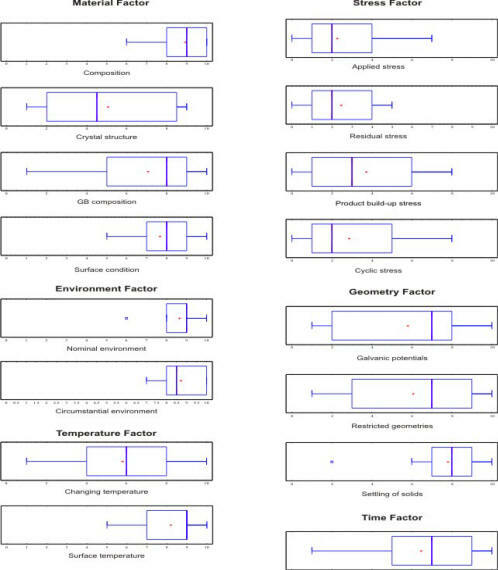 The following Figure presents the Box-and Whisker plots of the results obtained with pitting corrosion.When presented in this fashion, such results can provide a useful spectrum of factor and sub-factor confidence levels. Propose some arguments to explain the high variance, visible in the previous Figure, between expert opinions on the factors causing pitting corrosion. Linking the corrosion factors with possible forms of corrosion in this fashion may provide guidance to inexperienced corrosion failure investigators who have typically limited knowledge of corrosion processes. 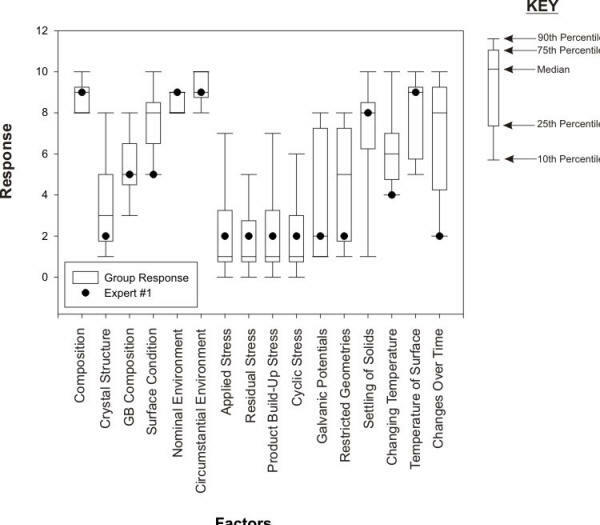 A listing of the most important factors should therefore help to increase the awareness of the complexity and interaction of the variables behind most corrosion failures and reveal how ‘experts’ have reduced such complexity to a reduced set of variables, as the compiled results of the survey indicate in the following Figure. An application of the compiled framework could be to test one’s skills against the ‘experts’ as illustrated in the following Figure. 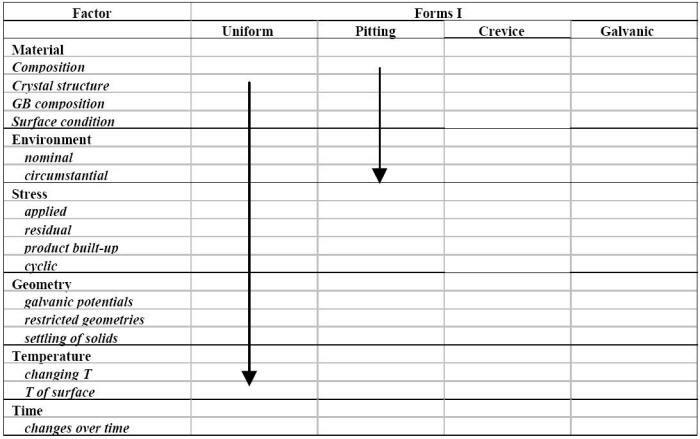 Another application of this practical correlation would be to use the framework of factors vs. forms for archiving data in an orderly manner. Analysis of numerous corrosion failure analysis reports has revealed that information on important variables is often lacking . The omission of important information from corrosion reports is obviously not always an oversight by the professional author. In many cases, the desirable information will simply not be (readily) available and require a special investigation to be completed.